Playing sport doesn't have to be hard, so we've made it as simple as possible to play a one-off game, whether this is your first time playing with us or your 1000th. We have 10 different sports and over 100 venues that our teams play at across Australia, so there's sure to be something out there for you! 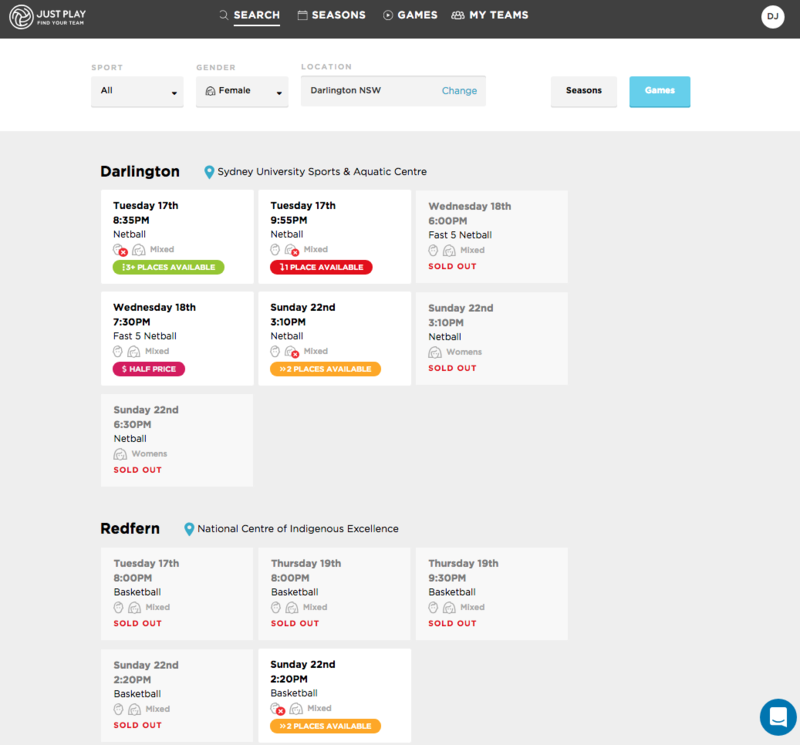 To get involved in a one-off game, it's as simple as searching the 'Games' tab via your dashboard or visiting our dedicated Games page and then booking in to play at a time and location that suit you. This is a great way to play if your new to Just Play and want to try a game out first, can't make your regular game and don't want to miss your weekly fix, or if you want to give a new sport a go. Almost all of our games are suitable for players of all skill levels, but we also list this on the game screen in any case - along with the number of places available. You can start playing immediately (on the same day you sign up, if you want to), and you can constantly vary the day, time, and venue that you play at. Play as little or as often as you want to - it’s super flexible, so you can make it work with your life. Games have a per game price and it only takes 60 seconds to book into a game using our straightforward platform (you can also use a 'game credit' to book in to a game if you have one in your account. Games credits are provided to season players when you update your RSVP more than 48 hours in advance of a season game, so that you can play a make up game with another team - more on RSVP's for season players here). On the booking screen you can see all the game details as well as a list of your soon-to-be-teammates for the match. 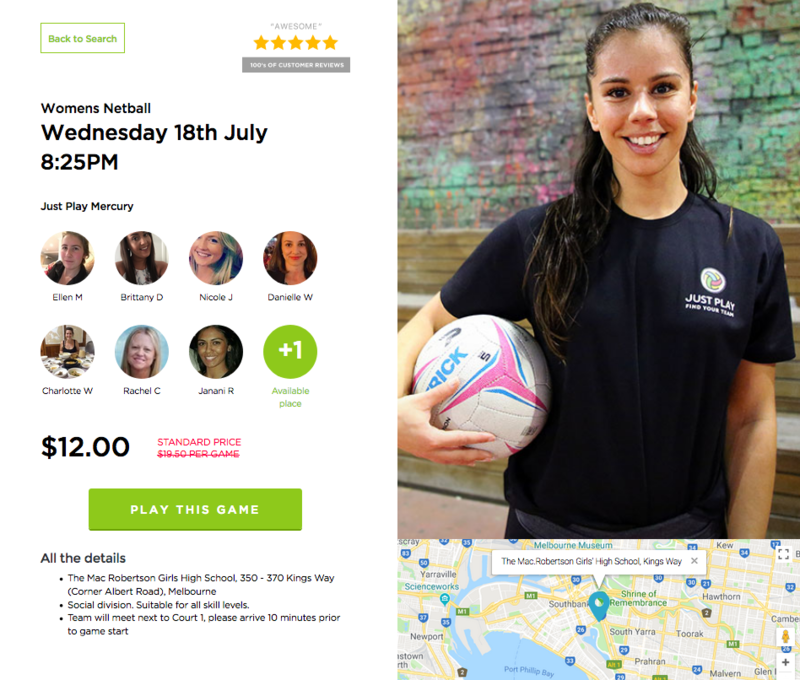 Once you book, the game details will appear in your dashboard and you will also be sent an instant email confirmation with a google maps link to the venue and any other important instructions you'll need to know (handy if you're in the of 99.9% of our players that have a smart phone).